Rotary Blood Bank (RBB) is an ISO 9001:2008 certified blood bank established in 2002, and is the country’s largest and most modern blood bank with state-of-art technologies and service. 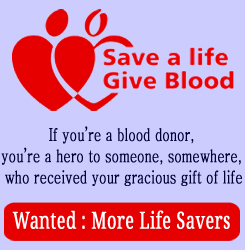 A pioneer in voluntary blood donation, RBB does not ask for replacement donors for providing blood to those in need. There is a shortage of over 1 lakh units of blood for patients in Delhi and NCR itself. Many accident victims, innocent children suffering from thalassaemia, pregnant women, cancer patients and other people in life threatening situations die due to shortage of blood. Rotary Blood Bank aims to meet the requirement of precious blood by organizing voluntary blood donation camps at education institutes, corporate offices and many other organizations and gatherings. RBB relies totally on voluntary donors and dispenses blood to those in need without asking for replacement donation.Voluntary blood donation is a selfless service and an expression of love for mankind. Blood knows no caste, creed, colour, religion or race. We have three suitably modified air- conditioned vans fitted with couches to help conduct blood donation, wherever access to locations of organizations is difficult due to narrow approach roads or other administrative reasons. Additionally, we have a dedicated team of qualified and trained professionals who follow stringent screening procedures, careful documentation and Good Laboratory Practices for collecting, processing and testing blood. We have a very dedicated motivation team which is constantly working hard to disseminate the message of the goodness in donating blood by extending your arm to help your brethren. Blood donation is harmless, painless and absolutely safe and is, in fact, good for health. 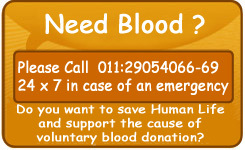 So if you wish to save a precious life, support Rotary Blood Bank and donate blood today!